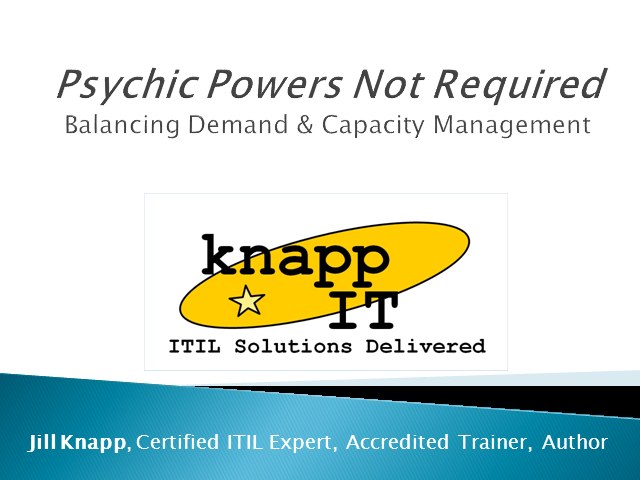 Unless your IT Department is staffed with clairvoyants, you’ll need two ITIL processes to balance business demand for services and IT capacity. Attend this BrightTalk presentation with Senior Consultant, Certified ITIL Expert and Author Jill Knapp of Knapp I.T., Inc. to learn how two processes, Demand Management and Capacity Management, work hand-in-hand to match IT capacity with the current and future needs of the business. Jill Knapp is a Certified ITIL Expert, a Distinguished Professional in Service Management, and the author of ITIL V3 Foundation Exam Video Mentor (Pearson/InformIT, 2010). She is also the President of Knapp I.T., Inc., a small but mighty IT Service Management training and consultancy firm based in Wilmington DE.